Tomorrow morning we'll host our first scheduled Beginning Spinning Class for a few folks who have indicated an interest. Other folks who already spin are, of course, welcome and invited. I find that the more people that get together to spin, the more learning can go on. 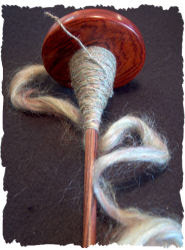 Everyone has a little different take on this ancient craft, and sometimes, just watching different spinners can help the newbie pick up some small thing that makes all the difference. Me, I teach the "park and draft" style on the drop spindle because I like how that method allows the spinner to separate the different operations and work on each one in turn: pinch, twist, draft, repeat. As the spinner gets more time in the chair, as we say, the operations can meld together and blend into a smooth flow. Not all people need spindle work before wheel work, but I think most benefit from the transition. In any case, it will be loads of fun. Y'all come. I think some other folks have planned to drop by later in the day to officially welcome the new alpacas. Bring a camera. We've moved into the hot-and-muggy portion of the calendar year, and even though the official first day of summer is a little ways off, the temperature qualifies as Summer to all of us who spend time outdoors. I've been relieved to see that the new little suri alpacas mind the mid-day sun less than the huacaya boys do. Maybe that's because the huacayas are mostly dark and the suris are nearly white, or maybe it's the difference in the fiber (fluffy vs. drapey), or perhaps a combination of both. Speaking of critters who don't like the heat, today Ted and I got a lot more wool off of our poor Babydoll ram, Zacchaeus. He still looks like he was mugged by Edward Scissorhands, but I think he'll be much more comfortable. That Babydoll fiber is something else-- it's like a solid, spongey surface, instead of individual fibers. I'm still fiddling around with the electric shears. I'm certain I'm not using them absolutely perfectly. I adjusted the tension knob today and got them to run quieter and cut much better than before. I hate learning by trial and error; I'd much rather have a teacher show me the ropes, and save me all those time-wasting errors. If you hear of a shearing teacher in my neighborhood, give me a shout. I might even consider hiring a shearer to do the whole job next year, if I could find a good one around here. In the meantime, I'll continue my yearly hack job on all the poor sheepies. Ah... It's a nice night. The Red Barn (where I'm currently relaxing) is reasonably presentable, considering it's lined with piles of fiber bags. We are coming down the home stretch of having all the fiber ready to go off to the processor. You should see all the colors and textures! We can see light at the end of the tunnel, and will have everything clean and ready to process in the next week or so, I hope. I really want you to be pleased with your harvest share. How about you? What's your favorite thing about this time of year? Picnics? Watermelon? Full-blast AC? Bare legs and SPF 50? I keep it pretty cool here in the Red Barn so that I'm still inspired to knit. when are we going to have more podcasts??? I lurrrrrrrrrve that nose! So cute!